Are you and your family struggling to use the Internet because it seems to be running slowly? Do the problems only seem to occur intermittently? Has the broadband worked fine and reliably in the past, and you are sure nothing has changed, yet all your devices are struggling to stay connected to your broadband router or get any decent speed for downloading, streaming, video chats or gaming? Are you using one or more Windows 10 computers? If so, read on, because we may have a solution for you. Here’s a brief rundown of our story, to set the scene. If you’re already tearing your hair out and just need the solution, scroll down here. My wife has recently started her own business full-time from home. I already work at home. Our broadband has been generally reliable, both with what’s coming in on the telephone line from the street into the router, and how it’s distributed round the house via Wi-Fi. We have an unlimited package and tend to get download speeds at around 18-20Mbps. Certainly fast enough for downloading, streaming videos, on-demand TV, gaming, and general Internet usage. However, for the past couple of weeks, our Internet quality has become really fragmented. The external connection is just fine, but speed drops in and out. It sometimes makes video conferencing (which is now a really important part of our business) impossible to do. We thought our wireless signal was dropping out, so we’ve invested in some extenders, including wired Powerline adapters which work using the electric cabling in the house. I then took a look at our router’s control panel and noticed that the amount of data being uploaded was skyrocketing, even though neither of us were intentionally sending anything out onto the Internet at the time. 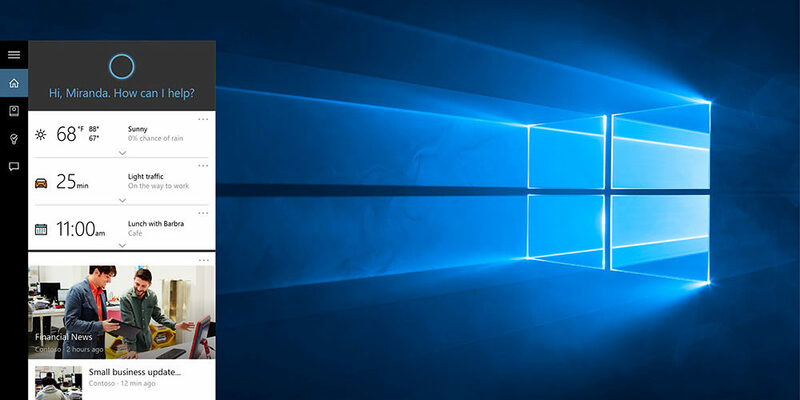 Microsoft has decided to implement a fairly hidden ‘feature’ in its latest Windows 10 operating system. You’re probably familiar with Windows receiving software updates from time to time. Roughly once a week or so, Microsoft pushes out an update to Windows which addresses any bugs, security issues, feature enhancements and so on. Often these happen automatically, and you only notice them if Windows decides that you *must* have them that minute – regardless of whether you’re working own something important and don’t want your PC to shut down and start up again. You’d be forgiven for thinking these updates come over the Internet solely from Microsoft’s own computers. In reality, Microsoft has utilised “peer-to-peer networking” to deliver its software. What this means is that your computer can be co-opted into a network of Windows 10 computers across the globe, to aid in the distribution of software. This isn’t a bad concept in itself. The BBC iPlayer does this, amongst many other legitimate pieces of software. The rub is that your computer, once updated with the latest download of Windows 10, can serve other computers. This effectively happens behind-the-scenes, with the only noticeable side-effects being a possible slowdown in Internet connection. Couple that with the fact that most domestic broadband connections have significantly faster download speeds (getting information from the Internet) than upload speeds (putting information out onto the Internet). This makes the problem much more noticeable when time-critical applications (such as a Skype video call) are in progress. This is when your download and upload connection are both being used. Most people have a reasonably high download speed, but the slower upload speed means a bottleneck soon occurs. The solution requires a bit of digging around in the Windows settings panels. You will likely need administrator privileges in order to do this, as it is changing system settings. 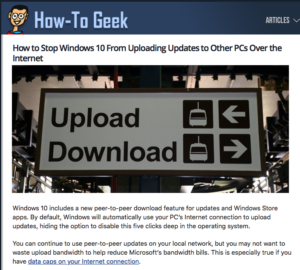 An article by How-To Geek explains how to fix the problem, including screenshots. The most important part to implement is in the first section “Disable the Uploads”. Since disabling this sneaky feature, we do seem to have a much less flaky Internet connection. We haven’t fully tested a video call yet (will update the article later when the next scheduled call has happened) but we’re pretty sure Windows 10 isn’t leaking out data to any other computer which needs it. I’m frustrated that Microsoft has chosen to implement a feature so quietly which can have such a detrimental effect on an Internet connection. At least the option is there to switch it off, if you know about it in the first place. Anecdotal evidence from some other users who’ve just discovered this, and made the change, are that their Internet connection is working better. Time will tell, and no doubt we’ll have to continually monitor things in case Microsoft reinstates this service or dreams up something else. I hope this article has helped you. Massive thanks to the How-To Geek, of course, who did all the hard work of putting together the tutorial. Do spread the word to anyone else on Windows 10 who might not know about this issue, particularly if they’re having Internet issues.